The writing prompt today was wonderful yet limited. Select only one teacher? Anyone who has read the various ponderings here knows how ‘indecisive’ I can be about some things. The objection to the prompt isn’t in spotlighting one teacher, but the chance to spotlight educators who have crossed our paths no matter how early or late in our lives. Mrs. S made an impact on me in pre-school, not only with her kindness, but in drawing me out of my preference of corners/hiding. She was the first non-family member to give me a book (The House that Jack Built, on the left). The storytelling time made my imagination jump all over the place, beginning with the belief that I could go to ‘house-building school’ to make my own house, just like Jack’s, each room devoted to the other things I’d do when I grew up. Ms. J. opened the world of reading to me while trying to keep me focused long enough to finish a book – or pull my attention away from a book to do something else. Mrs. C patiently helped me see things anew as I protested the notion of having to wear corrective lens for a time. Mrs. B. gave me a reason to stay after school, to see what teachers did when we all left. Who knew how much work went into the next day’s art project? Mr. K shared a personal side with us – his music. Nothing was impossible, he told us, if we were willing to try our best, help one another and be honest with ourselves, being fearless as we did it. Maybe that was why the entire class had an easy time recording his songs that he taught us, recordings he gifted us at year’s end. Mr. W. was all about exercising the mind – and being mindful during dodge ball. After lunch, we were always greeted with a ’20-questions’ challenge, the expression ‘stupid question’ banned in his room. We learned a new way of looking at things, and that included a middle-school level of vocabulary. Mr. O, Mr. S and Ms. W. prepared us as best as they could for middle school, each in their own way. It didn’t help that Mr. O was one of my parent’s least favorite teachers for a variety of reasons (one major impact taking decades to overcome). I learned from Ms. W to question assignments calmly, to challenge unfair decisions and prepare to argue anything. Mr. S taught us to survive. Ms. N, Ms. M. and Mr. F. were the core middle-school teachers, Ms. N refusing to let me keep my writing in the shadows (something I surreptitiously did then and again in high school when I was assigned to her once more). Ms. M taught me the value of holding on to break times (something this recovering workaholic lets slip by now and again) and the need for a good dictionary and spelling guide book – both of which I still have. Mr. F. introduced me to the greatest science fiction series ever: The Dragon Riders of Pern. We were, sadly/luckily, the last class with that opportunity. Almost every high school teacher left a positive impact on me and a couple negatively so. Most professors at university were competent and concise, many patient; every teaching assistant helpful and the peers in study groups a lifeline. Grad school – most were fair, a few made me wonder and 3 were so inspirational and passionate – I would take the opportunity to learn from again in a heartbeat. Every one of these teachers, from Mrs. S. to Professor B. set the markers I had used in beginning my first profession – a profession I knew I’d do the moment I left Mrs. C’s room. I’m certain I learned more from all of the students I had taught over the years than what could ever fit into a textbook. Saving the best for last – my Sunday School teachers. Mrs. O made the old testament come alive and the miracles so easy to see. 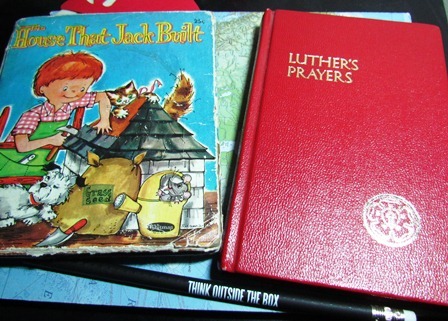 I treasure the copy of Luther’s Prayers Mrs. C. gave me. I felt humble getting a chance to teach along side her shortly after confirmation. I’ve been blessed with the bible studies led by different pastors, leaders, friends. Am I still finding educators to connect with? Yes. And given the various, vibrant, talented artists found here, I’ve learned a great deal more, too. This entry was posted in Ponderings and tagged Daily Prompt: Teachers Pet, gifts, gratitude, lessons, reading, teachers, writing. Bookmark the permalink. I am wordless. You were and are blessed. Teachers have an incredible opportunity to motivate and encourage us. It sounds like you had several in your childhood. One teacher in particular stands out for me. Interestingly, she was my 2nd grade teacher -moved away, then came back and was my 7th grade teacher! She always made learning fun, and she was such a positive influence in my life. She had a smile for everyone and she never raised her voice. I remember her reading Gone With the Wind to our class. She was able to get the movie and we showed it at the school. We made popcorn and charged admission to the public to pay for the rental (this was back in the day, when movies came on a huge reel and you used a massive projector!). Isn’t wonderful how some teachers can cross our paths more than once? Mr. S. went to the middle school the same time we did, making the transition less stressful in some respects. Ah, the advancements in technologies used in the classroom! No matter the tools, however, learning always involves a teacher with heart.